Photo courtesy of Plan B Entertainment, Inc. from FSU. 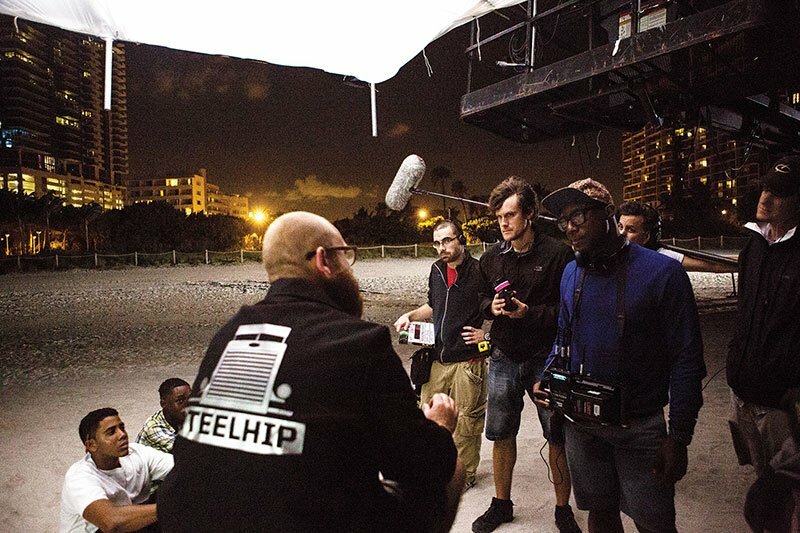 Director Barry Jenkins and crew on the set of Moonlight, filmed in Miami’s Liberty City in October 2015. Jenkins lived in the Liberty City neighborhood as a child. Don’t become too jaded by success or the lack of it that you lose the point of it all,” Barry Jenkins, the director of Moonlight, told an audience of rapt film school students a little more than a month after his film triumphed at the Oscars. Six graduates of the Florida State University College of Motion Picture Arts collaborated to make Moonlight, including Jenkins, who graduated in 2003. After earning eight Oscar nominations in February 2017, the Moonlight team took home statuettes for Best Picture, Best Adapted Screenplay, and Best Supporting Actor. Tickets to a Ruby Diamond Concert Hall screening and question-and-answer session with Jenkins on March 31 sold out in less than two hours. Even harder to get into was an event with Jenkins, editor Nat Sanders (’02), and co-editor Joi McMillon (’03) in the Askew Student Life Center held in the afternoon — a master class only for students of the College of Motion Picture Arts. With the whole film school in attendance, Student Life Cinema was at full capacity. Photo by Johnston Roberts. Brady Holcomb, working toward a BFA in production, lines up a shot for Ro[XY], a film of the FSU College of Motion Picture Arts. Then there are practical matters. FSU’s program is the only film school in the country to fund the production costs of every student’s motion picture — a big deal for students like Holcomb, who says that at other schools, “the films you make can be a question of whose parents have the deepest pockets” — and its Torchlight Program arranges internships for students with motion picture industry members and organizations, educating students in current and emerging business practices of the industry. The College of Motion Picture Arts can play a role in making those introductions. “We have alumni working in every significant role in every aspect of the industry,” Braddock says, citing the work of director Wes Ball and writer T.S. Nowlin on the commercially successful Maze Runner science fiction trilogy, David Mitchell’s direction of independent films It Follows and Under the Silver Lake, and Jonathan King’s production of the Academy Award-winning film Spotlight. He adds that alumni currently run several television series, including Arrow, Famous in Love, Gone, and Trolls. “If you wanna make it, man, just make it. Make the damn film,” Barry Jenkins told the audience of film school students, Brady Holcomb remembers. He liked this advice so much, he wrote it down. The College of Motion Picture Arts is dedicated to helping him follow it. For more information about the College of Motion Picture Arts, visit film.fsu.edu.